The Second in the New Year’s Resolution “Lunch and Learn” series was on “Making Better Food Choices”. 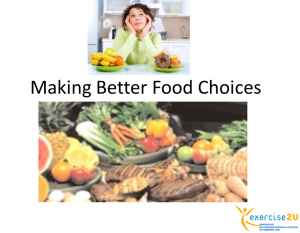 In this presentation we cover what is a “Smart’ food choice, Why we make poor food choices, When we make poor food choices, and what we can do about it. We also cover tips for navigating the aisles of a grocery store! You can download the slides HERE!